The ‘mini masterpieces’ could fetch up to £150,000, according to auctioneer Hansons. The rare archive of 270 original stamp and 40 bank note designs, painted in watercolour, was found after years spent gathering dust in a wardrobe by the family of the artist. The tiny works of art had to be done with a paintbrush in one hand and a magnifying glass in the other. Mr Fryer, who died at the age of 74 in 1964, worked as a designer for London’s Waterlow and Sons, a worldwide engraver and printers of currency, postage stamps, stocks and bond certificates founded in 1810. Adrian Rathbone, associate director of Hansons who discovered the archive with fellow associate director Jim Spencer, said: “This is one of the most unusual art collections I’ve ever seen. 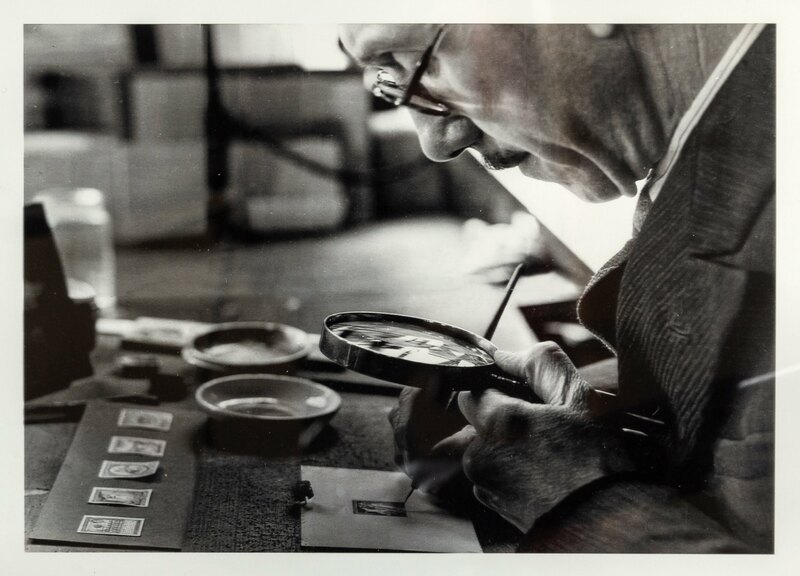 It’s a unique archive which not only demonstrates Mr Fryer’s talent but shows the intricate lengths stamp designers went to, to create something many of us take for granted. Dianne said: “We’re so proud of grandad’s work. I’m a retired graphic designer and appreciate what a wonderful artist he was, particularly when it came to portraiture. “The stamp and bank note designs were found after our aunty, Pauline Fryer, a fashion designer, died at the age of 84 in 2005. We had to clear her house in Redbridge, Ilford, Essex, and found them tucked away in a wardrobe in a spare bedroom. It was a complete surprise. We had no idea they were there. I’d imagine they’d been there for decades. “Grandad was born in Plaistow, Newham, London, in 1891 and worked at Waterlow and Sons from the mid-1920s until he retired. Our great grandfather, Augustus Fryer, was also a stamp engraver and our late father, Leonard junior, worked in the printing industry. Jim Spencer, works on paper expert at Hansons, said: “It’s wonderful to see how Mr Fryer painstakingly created his designs to scale – working within a tiny space which had to include a portrait of a monarch, a symbol of the nation and the price of the stamp. “Everything was carefully assessed and amendments made before any stamp hit the printing presses. Sometimes, one element of Mr Fryer’s work would play a part in the final concept. Some designs were adopted or formed the basis of the final design for the stamp. For example, Mr Fryer created several stamps for the Cayman Islands including King George VI 1938 1 ½ d and 2d value stamps and a 1 ½d black and blue beach view design together with a violet stamp showing the king’s face and a map of the country. Stamps were first introduced in the UK on May 1, 1840 as a part of postal reforms promoted by Sir Rowland Hill, who invented the adhesive postage stamp. The first issued stamp, Britain’s Penny Post, was released on May 6, 1840. The sale takes place on May 9.